Glad to see this spelt out clearly. If Abbott wins the election next year, and the Senate refuses to pass his legislation repealing the carbon tax, he will not hesitate to call a double dissolution. 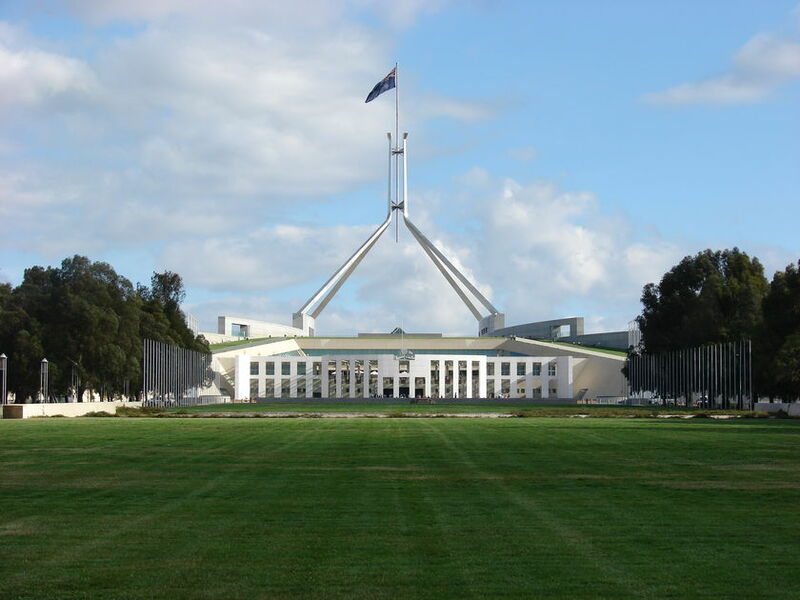 For our overseas readers, under the Australian constitution, if the Senate votes down a government bill twice, the government may call an election in which both houses of Parliament (Senate and House of Representatives) are dissolved and re-elected. See here for more information on this procedure. Australians will head quickly back to the polls if the Coalition wins the next federal election but fails to persuade the Senate to repeal the carbon tax, Opposition Leader Tony Abbott warned yesterday. A jubilant Mr Abbott said the carbon tax had played a role in the Liberal National Party’s overwhelming victory at the Queensland election which saw Labor’s presence in the state Parliament reduced to about seven MPs. Outgoing Queensland premier Anna Bligh and her predecessor Peter Beattie insisted the election had been fought on state issues but both urged their interstate and federal Labor colleagues to quickly learn from the humiliating defeat. Mr Abbott said the carbon tax had been one of the issues which had contributed to former Brisbane lord mayor Campbell Newman’s election success. He said a federal Coalition government would do whatever was necessary to repeal the carbon tax, including calling a double dissolution election. It’s hilarious how Labor and Bligh are desperately portraying this defeat as a minor local difficulty, without any federal ramifications, especially when a survey of Queensland voters put “energy prices” at the top of their list of concerns – something directly influenced by mad green climate policies pursued by Labor at a federal level. Oh well, let them go on believing that if they wish – the last thing we want is for them to come to their senses. This Queensland result will give Tony Abbott huge confidence in spelling out loud and clear to Labor and Greens exactly what he will do if they try and mess with him and the electorate over the carbon tax. It’s basically over for them but they don’t get it and never will. It wouldn’t surprise me to see his hand forced. I want to see them eat a lot of humble pie. I think he already has a lot of confidence on this issue and has clearly given his position on it. And our simpleton Republicans aren’t even paying attention to this awesome. They are the stupid party, rarely a match for the evil party. Consider yourself lucky Soylent, here in the UK the three main parties are both stupid and evil. And we don’t have the benefit of an elected second chamber, just a House of Lords packed with time servers from the other place plus some frock wearers with free passes. The Independence Party in the UK are standing up to the Global Warming doctrine with Nigel Farage leading them. Unfortunately they are quite a small party. They can say what they like, but me and my friends used the Qld state election to vent our hatred for Julia. The only thing that concerns me now is the Gillard-Brown Gang of Two going rapidly ahead with the recommendations of the Finklestein Travesty. By the next federal election, we won’t believe how good our fed gov is. I would prefer if you kept very quiet about the impact on the federal scene, thank you very much. I don’t want federal Labor coming to its senses any time soon because at the next election it won’t be baseball bats, it will be sticks of dynamite (figuratively speaking – lest anyone think I am inciting violence). Did you miss the exit polls ? 69 % voted as they did because of high electricity and energy prices. 44 % directly quoted the carbon tax as the prime reason for their vote. A large majority also cited distrust over broken pre-election 2009 promises. Does not bode well for Fedearl Labor – broken promise mistrust issues and deliberate policy of increasing energy costs. I have never before voted for a coalition government but I am intending to change my vote over the carbon tax and betrayal issues. Federal Labor is doomed – they will probably only have one seat in Queensland after 2013 and that alone will see them gone – I predict a landslide though – especially if they continue with the spin that the queensland election has no Federal implications – continue to lie like this and the electorate will clearly demonstrate that Saturday was as much an anti Federal Labor result as a pro Newman one !!! Fantastic result for Queenslanders and Australians et al. Tony Abbott is right to pursue this to a double dissolution if necessary. Echoes of the incompetent and corrupt Whitlam Government and don’t this mob deserve everything they get. What should also stand out is the clear message to the greens and Independents. Australians do not trust them anymore!! Wilkie and the other mob who turned their back on their own electorate by siding with Labor should now be prostrating themselves and lashing their backs with cat-o-nine tails. If they have not felt shame so far, they should hang their heads in shame now. Queensland has made a clear choice. We will not take any more lies, corruption or gross spending on total rubbish with our hard-earned tax money. The time for your libertine ways are over! Queensland, you have made me proud. I want a double dissolution. I want to see the Greens decimated. Agreed. The Greens are an evil corrupt party and Julia Gillard was idiotic in getting their support so that she could get the keys to the Lodge. She has come unstuck kowtowing to BB over the carbon tax and other supercilious idiotic ideas which the Greens have. Get rid of Labor and the Greens a.s.a.p. before more damage is done to Australia. get rid of the Carbon Tax and then what will TA (LNP) do? an ETS? The carbon tax influenced my vote in the NSW election and it will in the federal election.You would have thought the results in NSW,Victoria and now Queensland would make them sit up and take notice but i don’t suppose it will,talk about arrogance personified.I think they will have to learn the hard way which will be no more than they deserve. Juliar Dullard and the rest of the ex-ACTU loonies long ago forgot that in Australia we elect a government to serve the people. They think the people are supposed to serve the government and its whims. They will learn the truth at the end of next year. Abbott may be promising a double dissolution … but Gillard has already suffered a quadruple disillusion losing the states of Western Australia, Victoria, New South Wales and now Queensland! The exit poll from the election indicated that the carbon tax was a significant factor with voters regardless of Labor spin. Yes, I think that it has less to do with the carbon (dioxide) tax but it has lots to do with lying, just like Anna did with her constituents. Bring it on! In any case I’m prepared to wait. No need to write myself a reminder note. The carbon tax is a direct result of the lies so for me it has to do with both,the lies and the carbon tax equally. You have to laugh. In “The Australian” yesterday, concerns over high energy prices had been spun into concerns over the high cost of living and according to the pundit, the Carbon Tax was not an issue. Goebbels would approve. Do you think Tony Abbott’s comment ” climate change is real , humanity is making a contribution” is contrary to his REAL beliefs? How is the Coalition going to pay for the 15,000 strong Green Army? What will be the cost to taxpayers with the implementation of the Direct Action Plan? These questions seem to be missing in this debate. Seriously, after the amount of money labor has blown since it took office… I really don’t think anyone is going to care how the coalition pays for its promises. What’s important is that they keep their promises. Why is anyone suprised the government denies links between its carbon tax policy and the Queensland election result? They would have us believe a carbon tax is neccesary and will be effective, jobs will not be lost and peoples cost of living will not increase – despite all the statistics which put that lie to the sword. If the Queensland election is anything to go by, federal ALP is going to be anihilated to an extent not previously considered – I hope the greens and independents are wiped off the electoral map with them too! Bunch of scheming lying hypocrites. Federal election? Bring it on! Double dissolution will doubtless follow shortly thereafter. And where is the PM, while the nation is turning against her, in South Korea with her mate Obama, discussing how to keep Nuclear Weapons out of the hands of terrorists, how relevant, considering Australia doesn’t have any Nuclear Weapons !!! How fricking detached from reality can a person be. If Abbott wins the election next year, and the Senate refuses to pass his legislation repealing the carbon tax, he will not hesitate to call a double dissolution. It all sounds so easy, doesn’t it. I wish him well. But as a professional accountant, I know that once a tax is introduced, it becomes very difficult for any government to forfeit that tax revenue. I do not believe any future government can eliminate the carbon tax. What Abbott could achieve, however, is to halt phase 2… an emissions trading scheme. But even then, the ETS would serve an Abbott government just as well as a carbon tax. The problem is that Abbot, Hunt, Turnbull & Co all drink from the same poisoned well of IPCC pseudo science as does the Gillard government. So my view (even though I wish the carbon tax never was) is that the carbon tax is here to stay… forever and ever… like income tax, fringe benefits tax, capital gains tax, HECS, Gst etc etc etc. Mervyn just because you are an accountant doesn’t make you an expert on the carbon tax.I am sure Mr Abbot has looked into this matter and wouldn’t say it could be repealed if it wasn’t possible.If the LiberalNationals were foolish enough to vote in Malcom Turnbull as their leader i don’t think they would get anybody’s vote either.Malcom Turnbull should resign and join the Labor party as his views coincide with theirs.His carbon tax views are the reason he isn’t their leader right now.Just wondering if you are a Greens supporter. LizR, I do know a lot about the carbon tax. But my point is based on the history of taxation in Australia. Oppositions always whinge about a new tax, as though they are going to get rid of the tax when they win government. It never happens. The only significant tax ever to have been removed is the wholesale sales tax… but then that was part of the process when introducing the most successful tax of all… GST. The carbon tax legislation came about as a consequence of the passing of 18 “Clean Energy Bills”. The legislation is complex and probably full of defects because nobody had enough time to properly scrutinise the Bills. Gillard did it this way to make it almost would be impossible for future governments to repeal the legislation. As much as we all want the tax gone, the reality is it will be a very very very difficult task because “oh what a tangled web Gillard has weaved” to ensure that the tax will be her legacy to Australia. However, if a referendum were held and the people of Australia said get rid of it, Parliament would be forced to get rid of it but the country would have to face the budget consequences for the next decade. Mervyn you may know a lot about the carbon tax as you say and i don’t think it will be easy to remove but i still think it is not an impossinle thing to do.This is a tax the people of this country can’t afford it would be better to face a budget in the red for a number of years than a tax that will never go away,that will only continue to get worse and worse.As for the GST that was put to the people by John Howard and the majority of people voted for it which is exactly what should have been done with the carbon tax.This government lied their way into so called power by saying there would be no carbon tax and when they get thrown out just the same as Labor in Queensland have they will get no more than they deserve. THESE POLITICIANS THINK THEY ARE IMPORTANT ,WELL YOU ARE NOT// THE JOB ?YOU SHOULD BE DOING IS. All in the name of communism and nothing to do with the climate etc. Warmist are stacking already their guys, in winnable electorates for the conservative party. Now Abbott has one more vote in his camp, than Turnbull – he cannot say what he thinks, that; GLOBAL warming is a crap. After the election; will be minimum of 7-8 votes against him, in his camp (the treasurer and many other ministers will be Warmist, anyway).. They will be pushing him to siphon money from hospitals, university, pensions; to finance the green mobs; to keep preventing the phony GLOBAL warming Public will get sick of it; will realize that is better carbon tax, than no essential services. I was thinking that Warmist are 10 steps ahead of the Fake Skeptics, but I was wrong – they are more than 100 steps ahead. Small example: Qld state election is not crucial for carbon tax; but, for the first time in 108, there is ‘’conservative member’’ in my electorate. He, as a assistant editor of the local paper; two years ago was ridiculing me and all others: ‘’how come we are so stupid not to believe in the GLOBAL warming. Islands are already sinking / proofs of the global warming everywhere, need saving the planet’’. Money will be going to green mobs, only with less publicity. It’s up to you people, if you want to ask the organizers in the conservative party: are they going to nominate at least one non-believer in winnable electorate? Or, are you going to use your favored ‘’Ostrich Tactic’’ as usual.